The engine room was neat tidy and clean to kitchen standard! A deep long keel gives this yacht stability and sea kindliness. In excellent order throughout. There is hardly a blemish on the entire boat. This yacht has been maintained to a very high standard. She has just had a complete set of new external cushions made (not in the photos as safely stowed away). These Trader yachts not only make excellent safe cruising motor yachts but because of their design and construction provide very spacious and comfortable living space. She would make an ideal base in the safe port of Gibraltar from where she could range out to Portugal, in to Spain and across to Morocco. 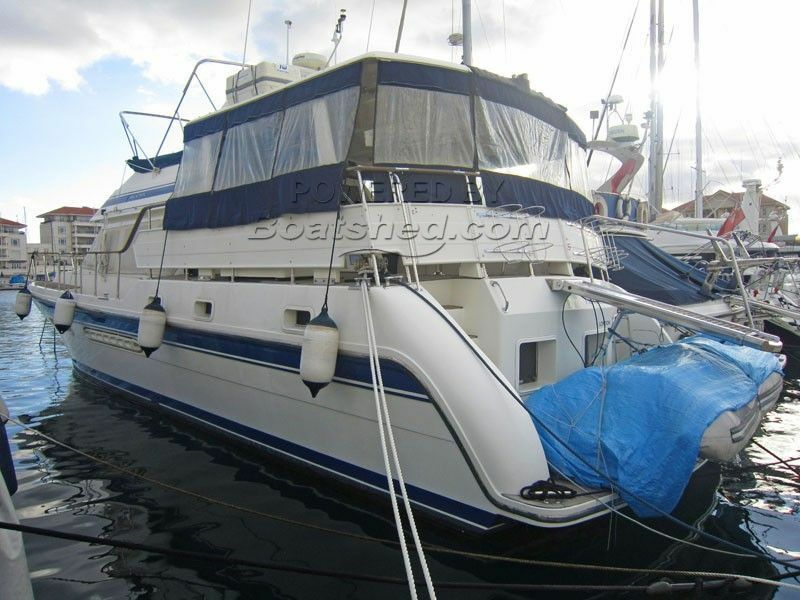 If I ever decided to abandon sailing I would go searching for a Trader 535 to motor yacht in my sunset years! This Trader 535 Signature Flybridge has been personally photographed and viewed by John of Boatshed Gibraltar. Click here for contact details.